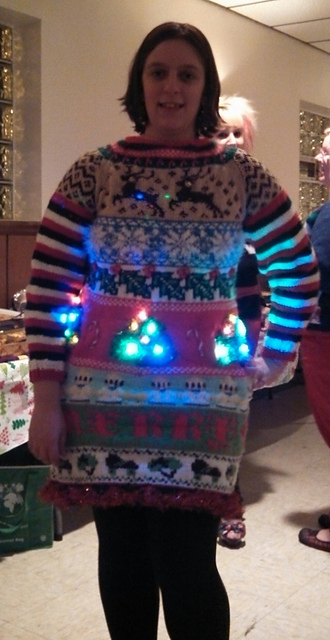 I've had the idea for awhile now to make an ugly Christmas sweater dress...and finally I had a party to go to. So, I started this at the beginning of the month and knit like crazy to get done in time! I used sparkly fun fur for the snowflakes and Christmas trees. I added lights to the Christmas trees and pipe cleaner candy canes. And what an awesome job of only taking a month (less than!) to knit it up. Not ugly ... a bit busy maybe, but not ugly. Wrong, but oh so right. This is amazingly hideously awesome! The lights make it extra ridonculous! I rocked it. This is the best craft I've seen this season. I post all my crafty stuff on Facebook. I'd LOVE if you'd like my page! That's fantastic. Well done you! Yeesh, I better start knitting now if I want mine done for next year I certainly can't whip that up in a month!!!! Wow! That is amazing! Great skills! This is the most fabulous thing I have ever seen. a feat of sheer genius and i want one. Wasabi Snobby~ It's green and it's hot! That is amazing! Great, awesome work! recycled repurposed denim and such for handmade accessories!